Due to the prolonged drought in Yunnan, Jing Mai’s tea has become more and more rare. 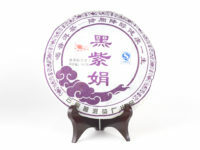 This is a great sheng puer to enjoy now or keep as a collectable. Jing Mai is situated along the Lin Cang (Mekong) river, between Xi Shuang Ba Na, Puer City and the Burmese border. It is mountainous and thickly forested with a perrenial “cloud ocean” surrounding its peaks. Jing Mai’s elevation reaches as high as 1662 meters above Sea level. In its lower regions, terraced tea gardens were developed by the government in this area in the 60s. The rich biodiversity of the area is especially evident in the early summer months when the air if thick with the fragrance of flowers. There is a 1,300 year history of growing tea in Jing Mai, primarily grown by the Bulang, Dai, and Wa ethnic groups. All of the villages throughout the mountains share tea as their livelihood and work in cooperation. The Bulang people in particular, are known for using the image of an opening tea bud as the carving that adorns their architecture. Every year these villagers will plant new tea bushes from seeds for future generations which will become yielding bushes within three years. These efforts to propagate new tea bushes year after year is vital to supplement the trees that naturally die or are slowed in their growth. This is method of agriculture is a far cry from the large commercial tea fields of uniform bushes growing in a line without other plants nearby. As a result, depending on where their seeds are sown and how the contours of the forest develop around them, these tea bushes yield and grow differently. We encountered a two or three hundred year old tea bush that was less than four meters tall, caught in the shade of a mammoth and much younger camphor tree, competing for its nutrients. This green puer cake is selected from mao cha from 100-200 year old tea trees which is naturally grown within the wildflowers and trees of the forest. When the bush yields in the spring and the forest is blooming, it absorbs a complex aroma. Being from old trees, this tea yields rich and complex flavors. Tea pickers collect fresh tea leaves in large bamboo carriers that rest on their backs. Once they are finished picking, they carry the leaves back to the factory. The leaves are piled together and left under the sunshine for a couple hours to remove some of the moisture naturally. A large, deep wok is used to fry the fresh leaves. These woks are not as hot as the ones that are used for hand making green teas. This allows enzymes to remain in the leaves. Puer tea has a lot more enzymes left than other teas, but it is unclear exactly how much more they contain. Once the leaves are fried, they are very soft and withered. A small broom made from local weeds is used to sweep the tea leaves from the wok on to a large bamboo tray. The leaves are kneaded by hand, which is the traditional way of making tea. Puer is not kneaded with a machine, instead are twisted and rolled by hand into their shape. During the kneading, a lot of moisture is released from the tea. Squeezing out the tea juice can help reduce bitterness in the processed tea. The leaves are thinly spread on to large bamboo trays and dried under the sunshine for 3-4 days, depending on the weather. The weather in Yunnan changes often, so some farmers have built sunrooms that still allow sunshine to continue drying the leaves. If the leaves are rained on, they will become moistened and create mold. Tea masters must be very attentive to supervise the process to make good tea. After the drying process, the twigs and unfolded leaves are sorted out of the tea. The whole twisted leaves are put into fabric bags and stored for buyers. Some farmers will compress cakes themselves, but not everyone has the skills and factory to do so. Due to the prolonged drought in Yunnan, Jing Mai’s tea has become more and more rare. This is a great green puer to enjoy now or keep as a collectable. The Dai minority group's totem is the water buffalo. Dinner with a Dai family in Jing Mai Mountain. Village market in Jing Mai Mountain. Tea is the most friendly international language. Maocha always comes with tea tree stems and leaves which need to be sorted out. Steaming mao cha for making puer cakes. The mold for compressing loose puer mao cha in to cake shape. The company will place their logo in the dry loose tea leaves before the cake is steamed together. 7 pieces are packed together in each bamboo shell bundle.